Update: Listen to (or download) the audio from Sami Awad’s public lecture here. The Wellington Abrahamic Council of Jews, Christians, and Muslims is pleased to present two opportunities to hear and interact with Sami Awad, the Director of the Holy Land Trust, an organisation based in Bethlehem focusing on nonviolence as the catalyst to end all forms of conflict and establish an enduring and comprehensive peace in the Holy Land. As part of Sami’s visit we have planned two events. Cost: Koha: we suggest $40+ waged, $5 unwaged. Leadership has many dimensions. Through vision, inspiration, strategy and determination, leaders move others toward outcomes. Too often, however, we envision leadership too narrowly; a leader takes us from Point A to Point B. We are usually constrained by past experience in envisioning future possibilities. Our solutions are usually new iterations of what hasn’t worked in the past. Holy Land Trust moves beyond these failures and frustrations through a practice called nonlinear leadership. Nonlinear leadership is a personal transformation process that enables leaders to engage in making the impossible possible. It addresses the question of what makes us see something as impossible. Leaders come to understand how powerfully the past influences our decisions in the present, for the future. With this awareness, individually and collectively, leaders become able to facilitate a process in which they build a vision of the future that honors, respects and learns from the past, while, at the same time, remaining free from its limitations. Tickets for this event are expected to sell out quickly. If you miss out on the workshop, you can still attend Sami’s public lecture below. If you are unable to purchase tickets through the Eventbrite link above, contact Dave Moskovitz on 027 220 2202 for other options. 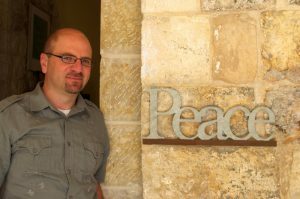 Sami Awad brings an important voice to the table in the discussion about peace in the middle east – the voice of nonviolence. Calling for a paradigm shift in peace and justice Sami, who established Holy Land Trust with Palestinian and Israeli peace activists, explained how his organisation tries to help people to look into the past with a different lens. Come learn about Sami’s approach to overcoming fear and violence to achieve lasting healing and peace in the middle east. You can help us publicise these events by downloading, printing, and posting our attractive event poster. For more information, contact us through the website, or ring Dave Moskovitz on 027 220 2202.